Continuing to translate this piece from VZGLIAD. The author, Dmitry Strauss, lives in Caracas, Venezuela, where he works teaching Russian and translating. Here is his analysis of the current crisis. The stormers (shturmoviki) of the Opposition for weeks and even months controlled whole neighborhoods in their “zone of comfort” – the wealthy and prosperous neighborhoods of Caracas, Maracaibo and Valencia, where an absolute majority of the population are sharply against Maduro and the Chavistas. They set up barricades, blocked traffic, burned garbage, broke windows, burned down government buildings and banks (the especially eager ones, getting a taste for violence, also continued a similar practice towards private enterprises), beat up passers-by whom they suspected of sympathizing with the government, and sometimes even murdered them. 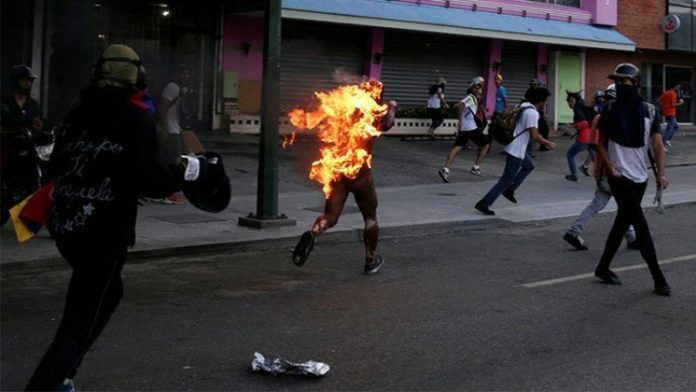 In 2017 (a man named) Orlando Figuero was doused with benzine and set on fire, in full view of hundreds of Opposition members. The video of his brutal execution was seen around the world, but this was by no means the only (such) murder. All of these actions were intended to hasten the desired goal of those who participated in these disorders: the collapse of the Maduro government. Once in a while disorders were also staged in neighborhoods of the lower middle class, and even the poor, but in those case the Opps were not able to establish any lasting control over these neighborhoods. In these neighborhoods the government enjoys more support. Attempts to block major highways were consistently thwarted by the police and National Guard. The attempt of a riotous mob to seize military bases in Caracas, also failed. Also unsuccessful were actions (in conjunction with the criminal underworld) to provoke massive looting of stores and markets. Although, in 2017, in various cities of Venezuela, as a result of such actions, several dozen trade centers were looted, even this cannot compare with the results of the massive spontaneous protests which took place 10 years before (Hugo) Chavez came into the government; at that time, in the poor neighborhoods of Caracas not even one store was left un-looted. Characteristically, during that the time the government belonged to friends of Washington, and the world media was not interested in the slightest in this “uprising of the masses”. In the end, the majority of participants of the disorders of 2014 and 2017, and their supporters, got tired of continuously boiling in their own juices. The disorders died down. And this is why the (current) protests and meetings, in and of themselves, do not represent a serious threat to the Maduro government. If, in such circumstances, Juan Guaido, until recently very little known to anyone, has decided to proclaim himself the President, this means that either (a) he is a completely inadequate politician, not capable of soberly assessing the situation and his own chances at success; or (b) he counted from the very beginning on foreign intervention and thus consciously took upon himself the role of a Washington marionette. In which case, taking into account the sharply deteriorating relations, in recent years, between Washington and Moscow, the ascension of such a figure into the (Venezuelan) government, would not bode well for the interests of Russia in Venezuela, independent of the fact, whether Moscow currently supports Maduro or not. 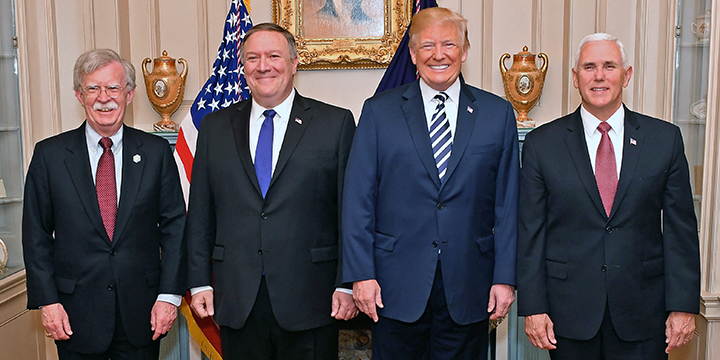 This entry was posted in Breaking News, Friendship of Peoples, The Great Game and tagged Juan Guaido, Venezuela crisis. Bookmark the permalink.